Sewing machine needles come in all types from ones meant for general purpose use to specialty needles. Choosing the right needle will make you sewing job easier. A Universal Point Needle will serve for most purposes. These needles have slightly rounded tips so they are suitable for most sewing on woven fabrics and knits. They range in size from 60 to 120. Obviously for doll clothes, we will be using needles in the 60 to 80 range, occasionally 90 for denim or other heavier fabrics. penetrating fabrics such as denim. They tend to last longing than universals. This is my choice for crisply woven fabrics where you want a neat line of sewing. Ball Point Needles are used for knits. Their rounded tips slide through the fibres of the knit without catching or making runs in the fabric. Stretch needles are even more aggressive needles for working on knits—they are essential for sewing knits with Lycra or that are tightly knitted. Their rounded tips will help prevent skipped stitches. Beyond these basic sewing machine needles, there are a number of specialty needles that may be handy for particular parts of your project. Leather Needles are essential for sewing on leather. Their triangular tips will keep the leather from tearing. 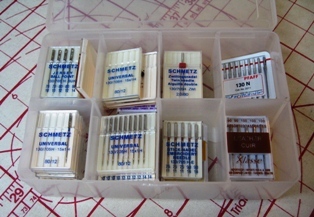 Embroidery Needles are needed for machine embroidery work, whether on an embroidery machine or done freehand. The larger eyes keep the embroidery thread from fraying. Topstitch Needles also have larger eyes, allowing you to use specialty threads or larger threads to top stitch your project. A Metafil Embroidery Needle is a specialized needle with an elongated eye that prevents your embroider thread from stripping and fraying. It’s especially handy for embroidery with metallic or decorative threads since it will keep them from breaking. Twin Needles come in various sizes and types. They also vary by the width of space between the needles. They are very handy for decorative work using two needles at once. Warning!!! Just be sure the hole in your general purpose plate is wide enough for both needles to move freely or you will break your needles—and twin needles are expensive! You may never use all these needles—a selection of Universals and Sharps is usually enough to get the job done. I keep a 5-pack of the others, just in case I need them.